The technology landscape is forever evolving. How do you manage it? With today’s consumers having an unprecedented amount of access to data and ability to easily share opinions, coupled with the advancements made within the corporate IT-the need to evolve your processes is critical. You need the ability to adapt and pivot toward predicting what will drive the next buying decision in order to stay relevant. This is where succinct solutions provided by ASI DATAMYTE for quality management, data transparency and cross-channel collaboration within the enterprise add significant value. Manufacturers also need quality control technology that feeds precise and actionable data from the point of product design through end customer use. 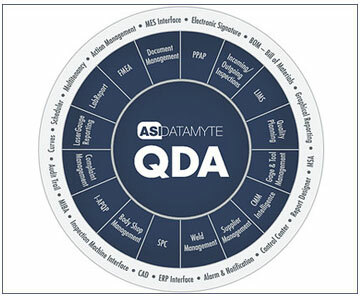 ASI DATAMYTE helps manufacturers, and their suppliers, create an economically sustainable quality system to do just that. From the beginning, ASI’s quality management solution has been designed with information management and the ability to take corrective action in real time. The company’s solution suite offers the agility and visibility manufacturers need to be successful, especially with changing global quality standards. How? They believe that incorporating your hardware devices (i.e. data collectors, gages, measurement tools, etc.) alongside of your processes with the joining factor of your software application is the key to your future success. Do you believe it? We do. The company’s solution gives you a 360 degree view of your manufacturing with the most powerful tools available to minimize risk and increase global profitability. “Developing a thoughtfully planned and structured, enterprise-wide system, supported by experts around the world, is what anyone can expect from the full-fledged ASI team,” affirms Rick Bump, President, ASI DATAMYTE. Innovation and advancement at ASI DATAMYTE is focused heavily on delighting their clients. “We work alongside operators and managers on the plant floor as well as senior executives in the manufacturing space to provide our clients with a solution capable of meeting all of their needs from design to their end-customer use,” reveals Bump. New wireless data collection and Bluetooth enabled torque solutions are just a few of the advancements the team has been releasing. The creation of these products was driven by a need in the industry for improved ergonomics, speed of data collection, and document/process sharing with real-time updates. The same rigor and excitement goes into the company’s software and consulting services innovation efforts. “We’ve found that by collaborating with clients and focusing on their end-customer’s needs, we are able to prioritize our efforts and deliver solutions with real value,” adds Bump. ASI DATAMYTE has earned a virtual blue chip client list due to the breadth and depth of their solutions. The company serves the top fifteen automotive OEMs globally and many other top manufacturers in various verticals. For instance, a global tire manufacturer’s challenge was to create a dynamic set-up for evaluating and properly benchmarking their end-to-end tire measurement processes across multiple plants. ASI’s team addressed this issue by implementing the Quality Data Assurance (QDA) SPC module. A CpK calculation based on standardized values was introduced allowing QDA Report Designer to calculate the Cp and CpK for a given process. With this calculation, the client was able to achieve centralized up-to-date data aggregation and reporting. ASI also implemented a “traffic light” at each machine showing the current CpK for a process. As a result of the implementation, the client’s global plants were able to have a standardized calculation as a benchmark to ensure that their products maintain the expected quality. Going forward, the company aims to aggressively invest in expertise that can be shared with clients globally. “As we offer hardware, software and consulting service quality management solutions, we are working on deeper integrations,” says Rick. “We also plan to develop solutions that meet the client’s growing needs—including demand for enhanced ergonomics of handheld devices, wireless features and analytics capabilities surrounded by superior user interfaces,” he concludes. A company that provides integrated software, hardware and services for driving best-in-class quality in manufacturing.